Below are a few examples of the same design. The one on the left is DIE-CUT from a single color roll of vinyl. While the one on the right is PRINTED (or "full color") on a background. 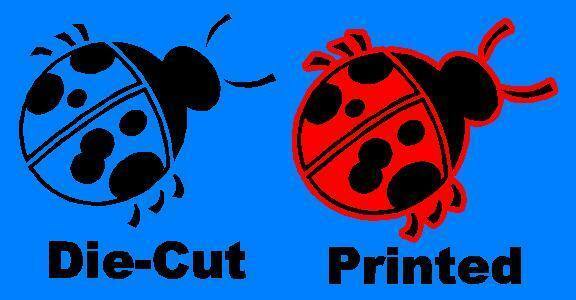 On some occasions a decal may need to be printed as the small detail within the design can be too small to cut on a plotter. 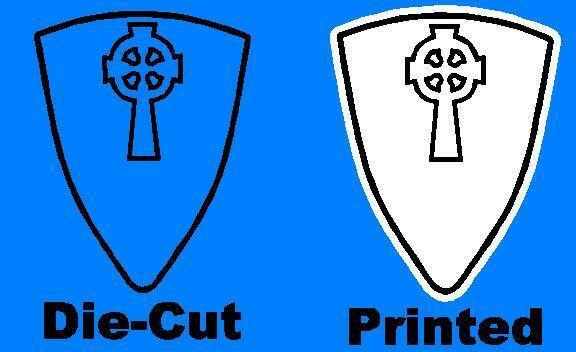 The image above shows a die-cut decal made from black vinyl on the left. The image on the right shows the same desing with black ink printed on a white background. The image above shows a die-cut decal made from black vinyl on the left. The image on the right shows the same desing with black ink printed on a red background. Note that not all printed decals will have this style of background. Some will still be die-cut but filled in with patterns/colors. Read the description or look for a thin gray line in the image which represents the cut line of a FULL COLOR style print. It should be noted that with most of the designs listed on the site, any of the colors can be changed to whatever color you want. You are not limited to the decal being just black.